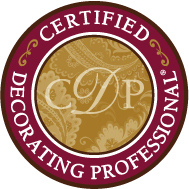 Become a Certified Decorating Professional ® (CDP) today! Seats fill on a first come, first served basis. A $500 deposit is required to reserve your seat and the remainder of the tuition is due two weeks before the start of class. Please call us with any questions you may have. Certified Decorating Professional ® is a registered trademark filed with the United States Patent and Trademark Office. Please submit your registration form and then return to this page to leave your deposit or pay in full. Thank you. Register by July 12th for special price! Certified Decorating Professional®Certified Decorating Professional® 5-DayCDP® COLORCertified Decorating Professional® 7-Day Business by DesignRedesign/StagingCustom One-Day ProgramAccessorizing with Style!